Yesterday I described how I could get the networking info out from the VMM before a reinstall or if for another reason you need to get all networks defined. In an earlier post I described my add networks script and now I have extended it a bit. I have this week made a function of it and also I have changed the import file format to fit the export-file as you get with the earlier post mentioned above. In the function I create a logic network if it is not already in place, that is also done for the network site in the logic network. The logic network created utilize VLAN. 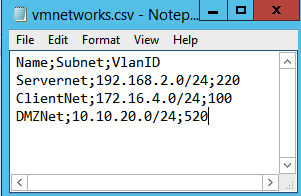 So If you create or export a file with the following columns, Name, Subnet,VlanID you are going to success. One thing that I wanted also was the possibilty to create just one network with the script and that has also been added. 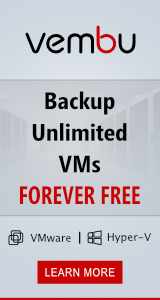 $vlans = import-csv $ImportFile -Delimiter ";"
$vmNetwork = New-SCVMNetwork -Name $vlan.Name -LogicalNetwork $LogicalNet -IsolationType "VLANNetwork"
$vmNetwork = New-SCVMNetwork -Name $Name -LogicalNetwork $LogicalNet -IsolationType "VLANNetwork"